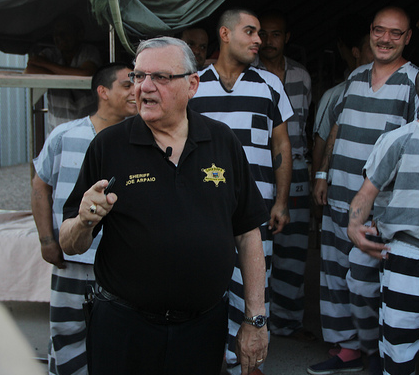 Sheriff Joe Arpaio was trying to stop Arizonians strictly based on racial appearence and inquire about legal status. He really was trying to do that. Fortuantely a Circuit Court of Appeals has rejected Arpaio's appeal. A federal appeals court on Tuesday denied an Arizona sheriff’s request to reverse a lower-court decision barring his deputies from detaining people solely on the suspicion that they’re illegal immigrants. The 9th Circuit Court of Appeals in San Francisco issued a 23-page ruling after considering the narrow question of a preliminary injunction while a Phoenix trial court considers the merits of the entire lawsuit against Maricopa County Sheriff Joe Arpaio. The appeals court ruling focused only on the lower court’s limit on Arpaio’s immigration powers and doesn’t confront the case’s ultimate question of whether deputies in Arizona’s most populous county have racially profiled Latinos on their patrols. A three-judge panel ruled U.S. District Judge Murray Snow didn’t abuse his authority in granting the order and said the ruling didn’t impair the sheriff’s ability to enforce state and federal criminal laws. A call to Arpaio’s office for reaction to the appeals court ruling wasn’t immediately returned Tuesday evening. A small group of Latinos claim Arpaio’s deputies pulled over some vehicles only to make immigration status checks during regular traffic patrols and the sheriff’s 20 special immigration patrols. A federal judge in December ordered Arpaio’s department to refrain from conducting such traffic stops while the class action suit was being considered. Arpaio appealed, arguing his deputies had probable cause to make the stops. The Latino group also accuse Arpaio of ordering some of the patrols not based on reports of crime but rather on letters from Arizonans who complained about people with dark skin congregating in an area or speaking Spanish. Arpaio has repeatedly denied the allegations, saying his deputies only stop people when they think a crime has been committed and that he wasn’t the person who picked the location of the immigration patrols. Both sides are awaiting Snow’s verdict after a seven-day trial without a jury ended Aug. 2. Snow hasn’t indicated when he would rule. The lawsuit marks the first case in which the sheriff’s office has been accused of systematically racially profiling Latinos, and will serve as a precursor for a similar yet broader civil rights lawsuit filed against Arpaio in May by the U.S. Department of Justice. There has never been a finding by a court that Arpaio’s office has racially profiled Latinos, though a case that made such an allegation was settled last year for $200,000 without an admission of wrongdoing by the sheriff’s office. Earlier Tuesday, the 9th Circuit turned back the latest effort by a civil rights coalition to bar police from enforcing the most contentious part of Arizona’s immigration law. Opponents of part of the law requiring police to question some people they contact about their immigration status wanted the federal appeals court to block its enforcement. That provision survived a U.S. Supreme Court review and it went into effect Sept. 18 after a federal judge in Phoenix said it could be enforced. The 9th Circuit denied the coalition’s emergency motion for an injunction pending appeal and their request for certification to the Arizona Supreme Court. An attorney with the National Immigration Law Center said the coalition is assessing its next step.